This photography is a Camera Motion Image Capture pulling light-stretching light resembling a flurry of hurricanes of light. 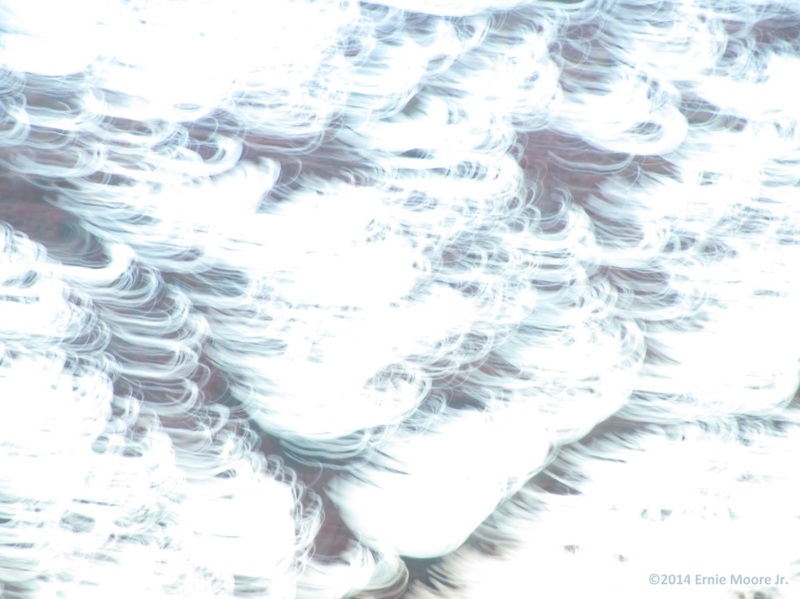 I didn’t understand this image, yet I liked it–it felt like something.-Ernie Moore Jr.©2014 Ernie Moore Jr. Here I make a note that I would like realism in the likenesses. And if I am lacking in understanding, I should develop that area. I go from unicorn to dolphin. Focusing on the head in both cases.-Ernie Moore Jr. Prior alphabet declinations could have less topics yet as many parts. Example:Ghost Hunting-one topic with several areas or aspects from which to choose icons. Well, apparitions, locations and instrumentations. All three of which can have multiple representations.-Ernie Moore Jr. This photodigital is of the bottom of the third page AB Blue Bird. There’s Pegasus, horse legs, unicorn tail and horse tail and hind quarter.-Ernie Moore Jr. I still have not picked out an icon for letter “A.” I might not have wanted to pick from just what I knew only to find out more and regret my choice or have to scrap what I have for a more reasonable selection. I might be looking at all I can for what I understand and choosing from that.-Ernie Moore Jr.
A review or establishment of the overall shapes allows me to theorize more quickly once I start selecting. I might have already done some selecting. but I seem to have gone on to section analysis of the subjects.-Ernie Moore Jr. Still examining shapes before picking an icon to begin the Blue Bird alphabet, this looks at horse/Pegasus hind quarters, horses from nose to tail, unicorn head with horn, horse on its legs. 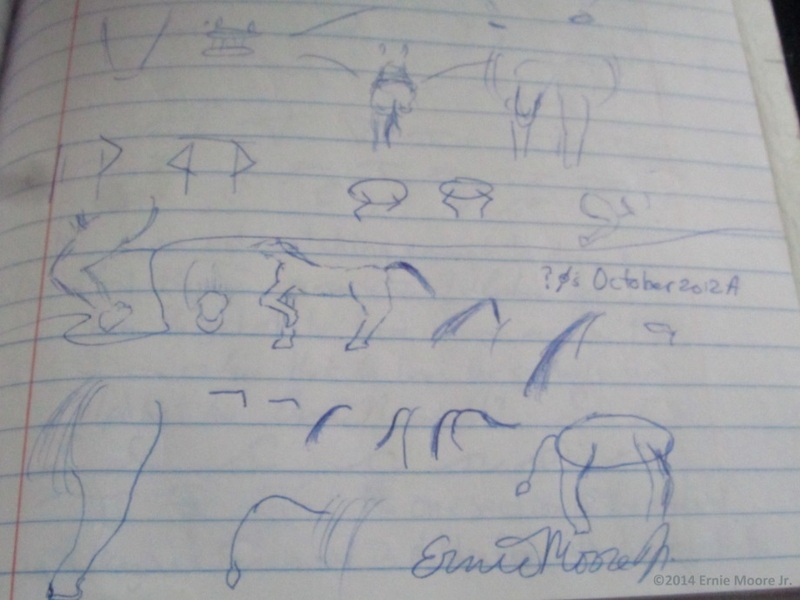 Notice the minimized~ strokes for the rear view of a horse. Also taking into consideration sometimes seeing a horse’s head from behind the horse.-Ernie Moore Jr. 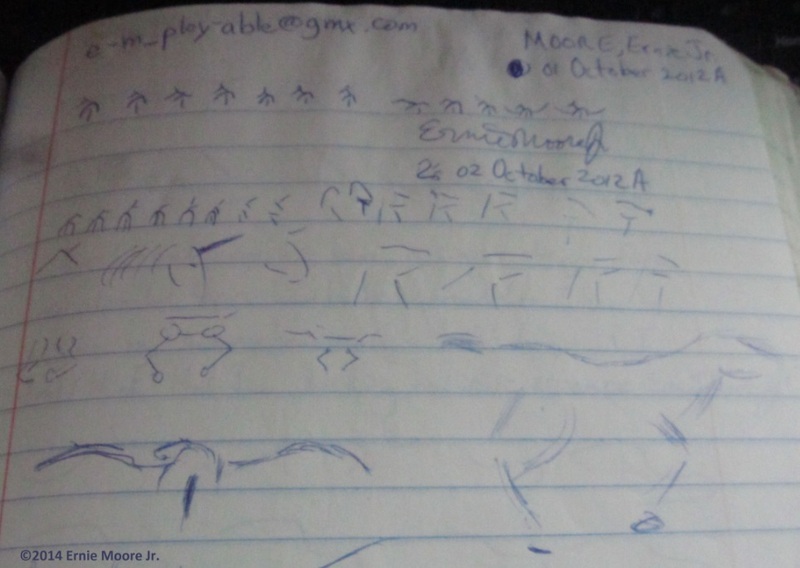 Here I explore other aspects [no pun intended] of the horse shapes and pegasus for AB Blue Bird.-Ernie Moore Jr. 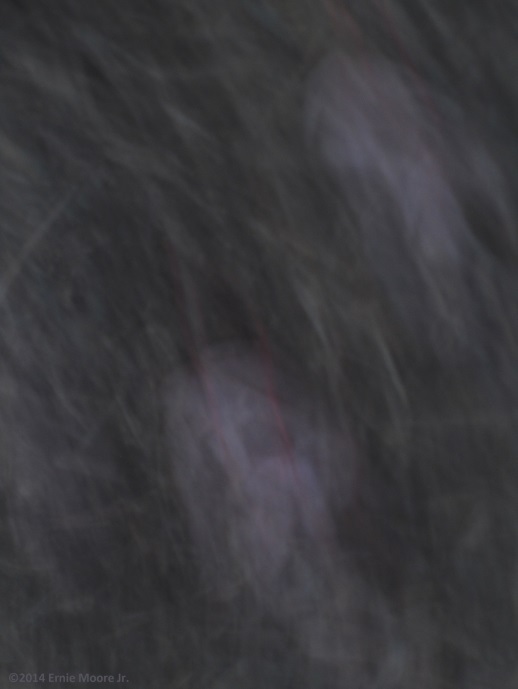 This Camera Motion Image Capture of twigs and leaves, stretching light-pulling light has for me a central focus of the resemblance of a Geisha. I thought the lighter image at one o’clock might be an over-the-shoulder of a Samurai. Continuing to look, The figure I had thought of as Geisha because of the face as I was making-it-out was perhaps masculine. The Kimono could also be worn by a male. There’s a darkness in the left hand-ish that could be a sword from which I can get the impression of Samurai.-Ernie Moore Jr. Within the kimono at the bottom might seem to be a brow line and shadow of a nose bridge. From here the face in the bottom of the kimono there might seem a hat wearing woman in older proper clothes. There might even seem two faces in the lighterness. Seeing the image smaller can give a different set of images.-Ernie Moore Jr. 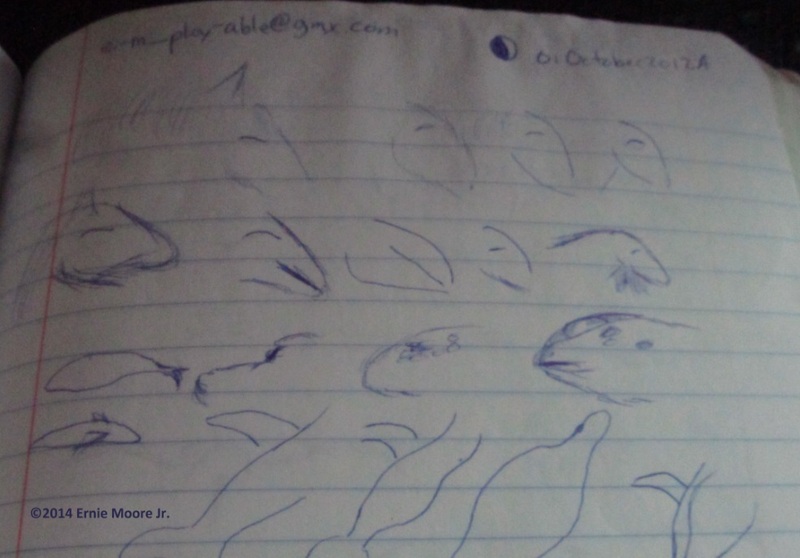 This Image Capture photodigital alphabet (AB) Blue Bird top of second page shows me looking at the basics of drawing a horse head-six parts:forehead to the nose, tuft of hair, ear, jaw, mane, eye. I liked how this worked out. My tactic is to do few and light strokes once one stroke is out of place–wrong to my thinking, I do one more to a few more to see if I can find a depiction I support by my understanding of it. Otherwise it stops and is considered complete when I start getting it wrong-ish. 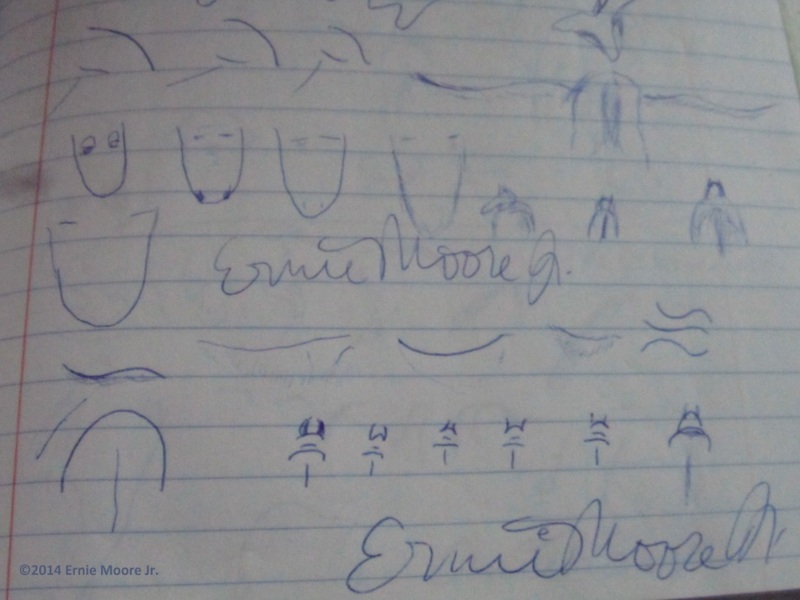 So my drawings I’ve done so far are very sparse.-Ernie Moore Jr. I continue to see what are the fewest strokes to make the object. 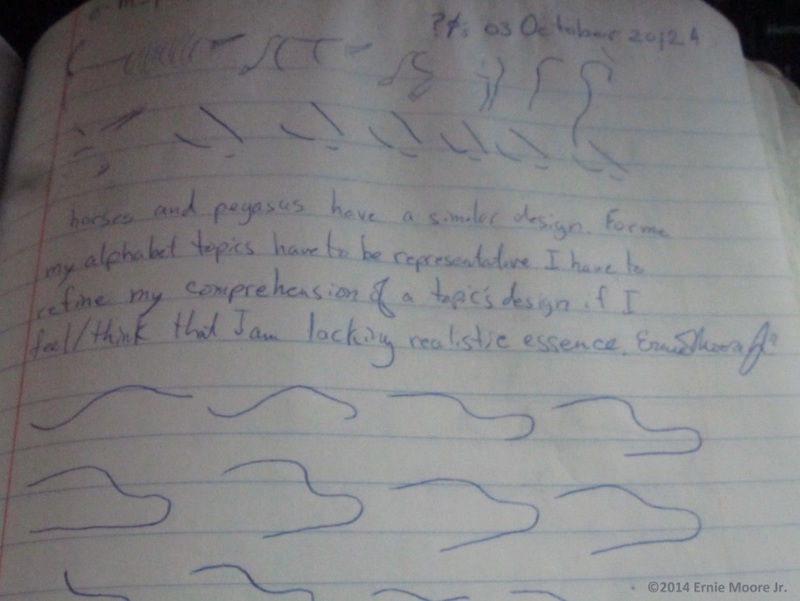 After I have a minimal number of- then I find the style for each stroke–where it curves and how much. I lose the tuft of hair and play with the thought that the forehead and jaw are the same line. needing to distinguish them with the right length of well placed line to indicate separation.-Ernie Moore Jr.
As I blended the top of the head with the bottom, I transitioned from horse head to dolphin head and the dolphin body-trying to get the fin from my brain to the paper.-Ernie Moore Jr.